When August comes around, it’s always exciting in lots of ways. For me being a teacher the summer is my one chance to catch up. It’s also usually when my family go on our summer holiday. This year we went away in July instead but there has still been loads of things to enjoy. Not only that but August means Great British Bake Off time! This year it’s starting later (think it’s Wednesday August 24th) due to the Olympics but the excitement and the build up for GBBO fans has started already. On Twitter I love to get involved with anything GBBO related and a few of my Twitter followers and friends are doing a bake along. It’s called #GBBOTwitterBakealong and there’s a different theme each week. When the Bake Off is actually on, we’ll be baking something from the show like the technical bake for that week or something connected with that week’s theme. This week on the Twitter Bake Along has been biscuits so we had to bake some biscuits and post them on Twitter. I love any excuse to bake biscuits so I had a look at what was left in my baking cupboard and also looked at recipes I wanted to have a go at. I looked in Mary Berry’s Foolproof Cooking and found the perfect recipe for busy weekend baking around all the other jobs I had to do. It was her recipe for Stem Ginger Shortbread. My whole family love it when I bake shortbread for them but aren’t so keen on the ginger. The recipe called for five balls of stem ginger and that’s exactly what I had to use up. It’s funny how my kids say they don’t like my ginger cookies, yet when I bake them they miraculously disappear. Out came my well used and loved Alan Silverwood traybake tin. It’s been bought thinking of Mary Berry and traybakes though this time, it was to make shortbread fingers. I greased it carefully with Wilton Cake Release then started on the shortbread itself. The stem ginger needed to be rinsed and patted dry so that the sticky syrup came off it. This was easy enough and then I chopped the ginger into little chunks to go into the shortbread. When I’d finished this, I then started on the shortbread itself. I put tiny cubes of butter into a large mixing bowl and then added plain flour, rice flour and caster sugar to the mixture. Mary’s recipe used semolina but I didn’t have any so I used some rice flour from the last time I baked shortbread. 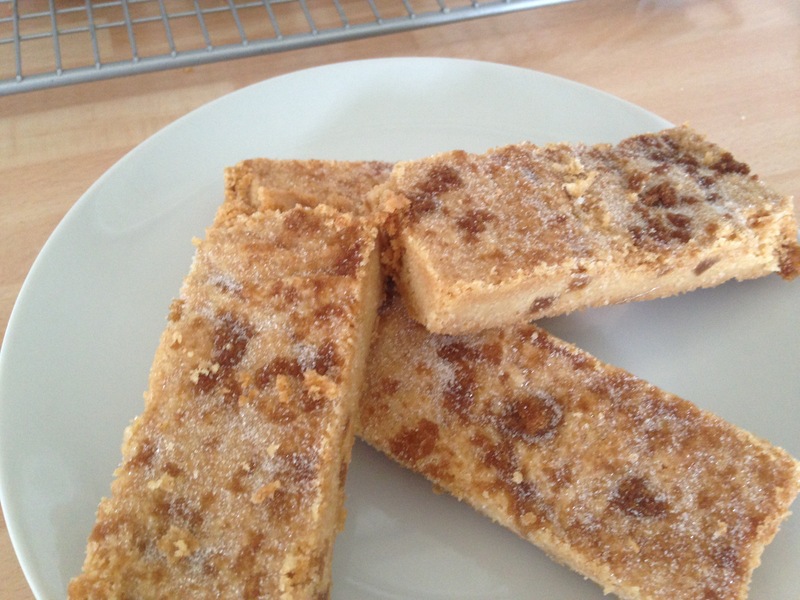 It gives the shortbread a nutty taste but works wonderfully well in the recipe. All the ingredients were rubbed in together and then formed to make up a dry dough. At this stage, I tossed in the chopped stem ginger and then mixed it into the dough evenly. The dough was carefully pressed into the tin with a back of a teaspoon so that it was level. 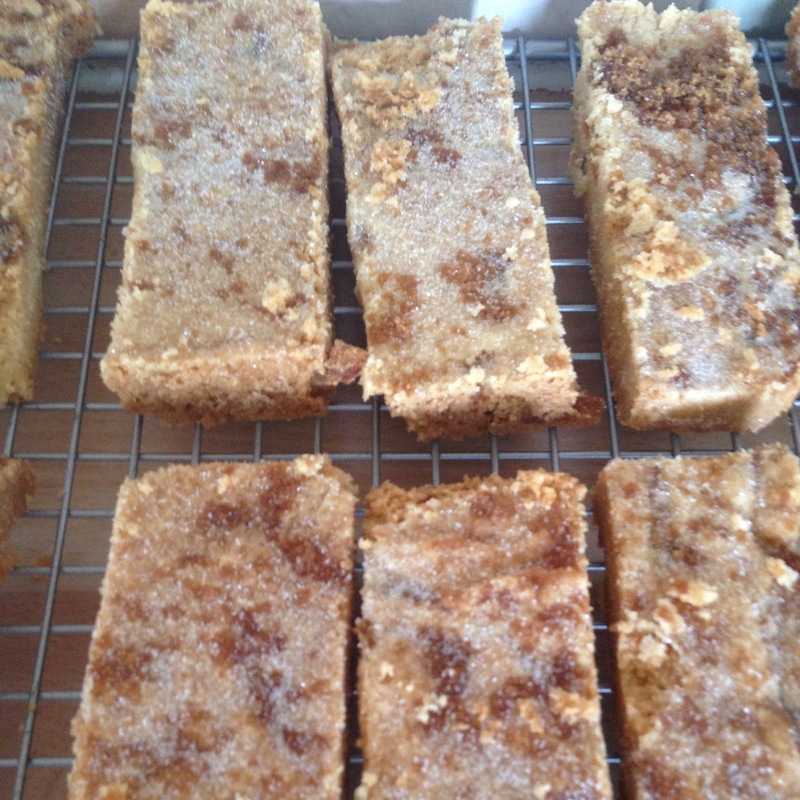 To give it a crunchy topping Mary Berry suggested sprinkling on two tablespoonfuls of Demerara sugar to the top of the shortbread. I didn’t have any demerara sugar so I used light brown muscovado sugar instead. This was a bit clumpy though. The shortbread baked for about 40 minutes and by this time it had turned a pale golden brown. The smell was just heavenly and I was so tempted to scoff one there and then. But I had to let them cool down so they could be cut up into fingers! The shortbread fingers were divine and they went down very well. As I type the day after, there are only 4 left! I need my jaw wiring with shortbread around! I didn’t eat them all though, please believe me! The shortbread was cut into 12 fingers. Though one finger is never enough! 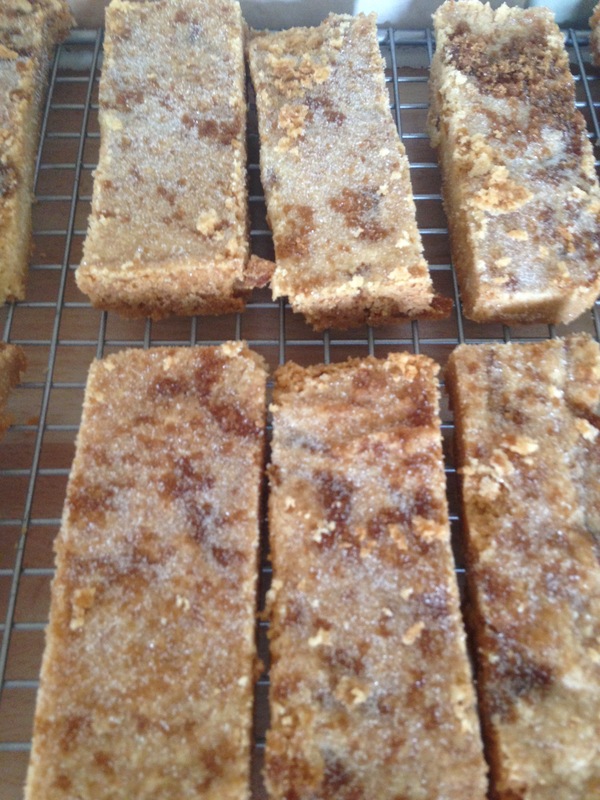 The Stem Ginger shortbread fingers were sprinkled with two types of sugar. 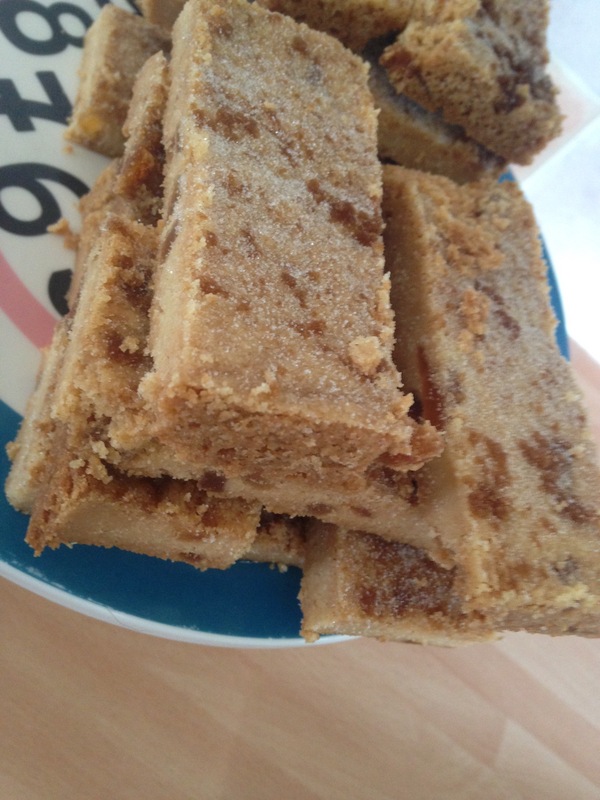 Stem Ginger Shortbread- from Mary Berry’s latest recipe book Foolproof Cooking.